Keywords: 3-Acetyl-4-hydroxy-2H-chromen-2-one, 3-Acetyl-4-hydroxy-6-methyl-2H-pyran-2-one, indoles, pyrroles, chalcones, alkylation. Keywords:3-Acetyl-4-hydroxy-2H-chromen-2-one, 3-Acetyl-4-hydroxy-6-methyl-2H-pyran-2-one, indoles, pyrroles, chalcones, alkylation. Abstract:A series of novel hydroxy-pyran–chalcone hybrid compounds 4(a-b), 5(a-f), 7(a-b) & 8(a-f) has been synthesized by employing simple methods in various approaches through convergent synthetic strategies. 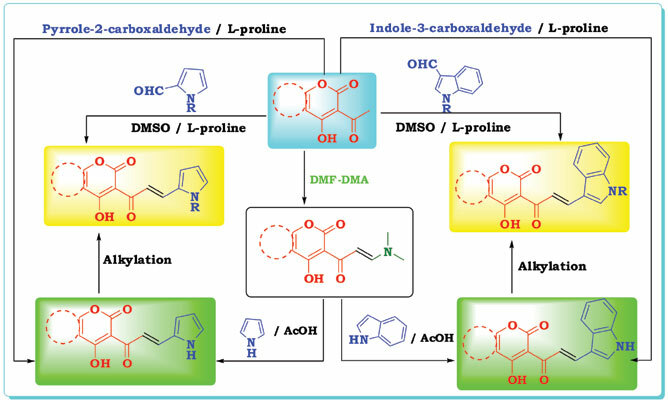 4-hydroxy-3-acetylcoumarin and 3-acetyl-4-hydroxy-6-methyl-2H-pyran-2-one have been used as starting materials and were condensed with indole aldehyde, pyrrole aldehydes independently to give the corresponding chalcones. To further explore, alkylation studies have been carried out on the synthesized hybrid chalcones. The synthesized compounds were established on the basis of IR, HRMS, 1HNMR and 13CNMR spectral data.